Copy, backup and burn your cds and dvds. The best money saving backup software on the market. An award winning piece of software, blindwrite lets you backup your private media collection protecting the originals from damage and loss. Preserve the quality of your cds, dvds and games by making a backup copy or storing them onto your hard drive. 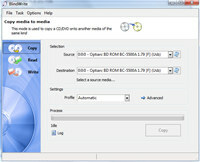 The software can be used for games, audio cds, data and movie dvds. Blindwrite is compatible with most media and media writers. A definite must have. Now compatible with vista. BlindWrite - CD and DVD copy is an utility that works under windows xp, windows vista and windows 7. It supports both 32-bit & 64-bit windows editions, therefore it could run faster on 64-bit computers. Estimated download time for BlindWrite - CD and DVD copy on a common adsl connection is less than a minute. Version 7.0.0.0 was released two thousand two hundred seventy five days ago by VSO-Software. Click the green download button to download it now.